Here are excerpts from a Workman and Temple Family Homestead Museum blog post about Boris Deutsch, an artist in Los Angeles, who was best known during the 1930s and 1940s. From his arrival in the city in 1919 until the early 1930s, he lived in Boyle Heights. S. Boris Deutsch (1892-1978) was a modernist artist (principally painting, but also a creator of ceramics and drawings) of some renown, especially during the 1930s and 1940s. His figurative works are held in the collections of such prominent museums as the Los Angeles County Museum of Art, the Museum of Modern Art in San Francisco, the Smithsonian American Art Museum, and the Norton Simon Museum. Among his most prominent works are a series of murals painted in the Terminal Annex of the Los Angeles post office, an exuberant Spanish Colonial Revival structure opened in 1940 next to the newly completed Union Station. He also was director of a 35-minute experimental film called Lullaby, created in 1929. Los Angeles Times, 27 March 1921. Born to a Jewish family in Krasnagorka, Lithuania, Deutsch was largely self-taught, though he spent some time studying at academies in Riga, Latvia and in Berlin. In 1916, during the depths of the First World War, he migrated to the United States, living for a few years in Seattle. By the end of the decade, he was residing in Los Angeles, specifically in the Boyle Heights neighborhood, where many Eastern Europeans, including Jews, resided. 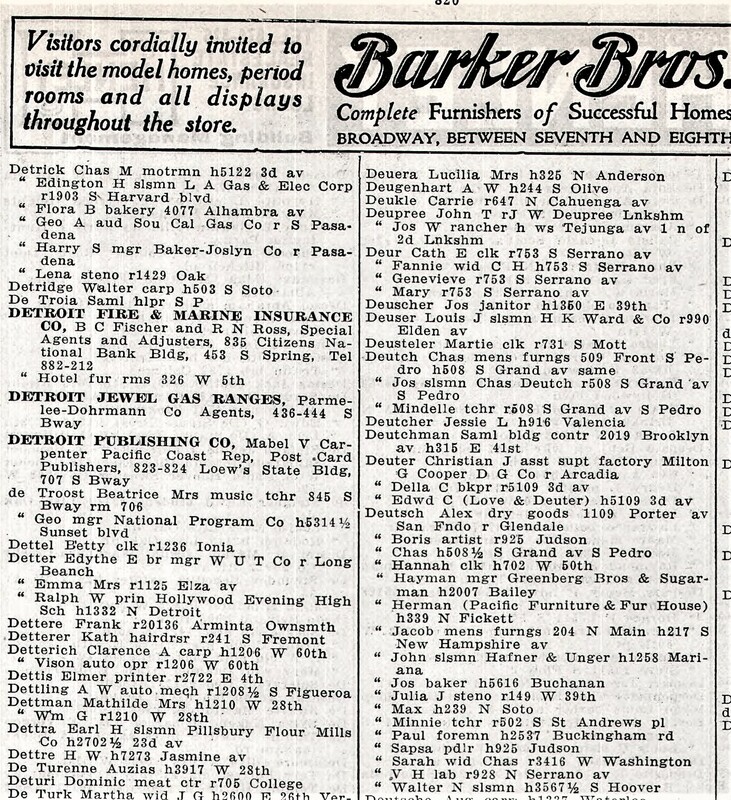 Los Angeles City Directory, 1924, showing Deustsch as living in Boyle Heights in the Prospect Park area. Deutsch quickly gained attention in the area, including for his portraits of film stars like Gloria Swanson and Charlie Chaplin. His works were also exhibited locally in galleries and at the Los Angeles Museum of History, Science and Art (note the order! ), now the Natural History Museum of Los Angeles County. Traveling exhibitions took his work throughout the west and across the country. The artist went on to receive further acclaim for his work in Los Angeles during the remainder of the decade, including an interesting 1929 review in the Los Angeles Times that highlighted as work depicting Jews in a way that led the writer, Arthur Millier to state that Deutsch "emerged from the obscurity of Hollnbeck [Boyle] Heights Jewry a few years ago" to become a "painter-genius." Millier claimed that the artist was "the antithesis of everything the average laymen expects of painting" with a restricted color range of black, white, brown, yellow and dull red "and he uses the paint as a language to express his feelings about the life of his own people." an American only sees the Jew who developed and manipulates the modern financial system, the Jew who belongs to his own clubs. Of the rank and file of the racial religious community of Judah he knows nothing. It is this community Deutsch interprets with masterly skill. This was because Deutsch was a student of the Talmud and prepared to be a rabbi in his youth and had a fundamental understanding of the deep religious traditions of Judaism. This included the "dearly-clutched fruits of faith" of the "obscure orthodox people whom he paints with a love" that included "irony and morbidity." 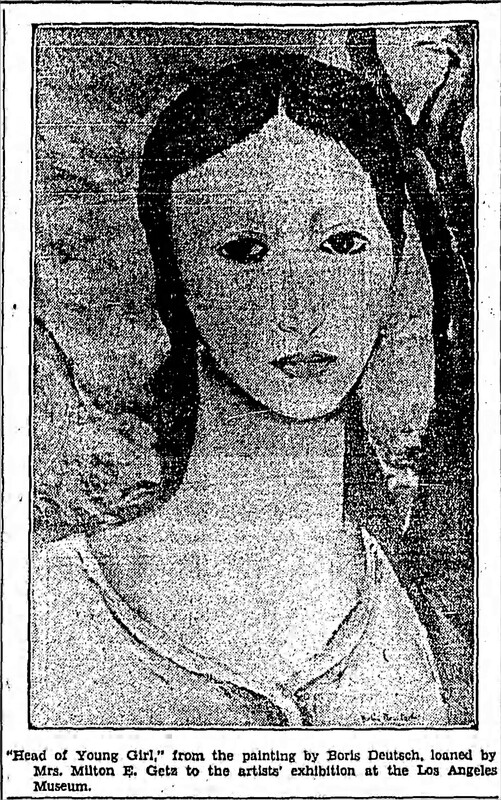 Los Angeles Times, 22 December 1929. With the onset of the Works Progress Administration, which hired many artists for projects in public buildings erected by the government agency, Deutsch received many commissions, though his work was not as well-known after World War II. Still, he continued to pursue his art, including printmaking and monotypes and lived to be in his mid-eighties, dying in Los Angeles in 1978.